Sister Bertha Virginia Sutton, CSJ, 78, died Friday, March 6, 2015, in Villa St. Joseph, Baden, in her 46th year as a Sister of St. Joseph. The daughter of Walter J. Sutton and Annie Walden Sutton, Sister entered the Congregation from the former St. Richard Parish in Pittsburgh. Sister Virginia ministered as Director of Religious Education at St. Richard Parish prior to her many years as a teacher and principal in the Dioceses of Pittsburgh and Atlanta, Ga.
During this time she served for 2 years as principal of St. Paul of the Cross in Atlanta, and 10 years as teacher at Mt. Gallitzin Academy in Baden from 1983-1993. She also served as Student Assistance Program Coordinator at Mt. Gallitzin. 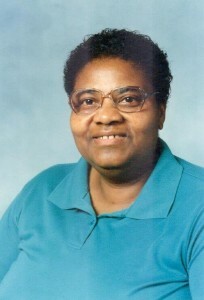 Sister Virginia ministered at the Learning Club in Northview Heights first as teacher then in 1997-1998 as Director. Over the next several years, Sister provided Medical Transport for the Sisters, and ministered in Home Care. Prayer Ministry was also a significant part of her life. As a lover of music, Sister Virginia was blessed with a beautiful voice and sang in the choir from an early age. In her early teen years she sang on a radio program from Dothan, Alabama. She also had a great love for reading books -especially anything dealing with the Church or the faith. Sister belonged to a number of boards and committees — among them, Benjamin Banneker Housing, The Catholic Interracial Council, and the National Black Sisters Conference and the Black Catholic Ministries. Sister Virginia is survived by six brothers, Thomas (Evelyn) of Tempe, AZ, John of Florida, Calvin of California, Gary Hunter of Atlanta, GA, Andy Eugene Hunter of Hattiesburg, MS, and Grady Hunter (Becky) of Atlanta, GA and three sisters, Annette (Walter) Davis of Albany, GA, Cheryl (Kenneth) Brodie, of Washington, D.C., and Jeanette Turner of Maryland, nieces and nephews, grandnieces and grandnephews, and the Sisters of St. Joseph of Baden. Friends will be received Monday, from 1-8 p.m. and Tuesday from 11:00 a.m. – 3:30 p.m. at the Motherhouse of the Sisters of St. Joseph. Mass of Christian Burial will be offered in the Motherhouse Chapel Tuesday at 4:00 p.m. Burial will follow in the Sisters’ Cemetery on the Motherhouse grounds. Donations in the name of Sister B. Virginia may be sent to the Sisters of St. Joseph Memorial Fund, St. Joseph Convent, 1020 State Street, Baden, PA 15005. Make a donation in memory of Sister Bertha Virginia.